We read a lot about the “tiny house” movement – some are as small as 225 square feet. While these miniscule homes are certainly not for everyone, many people are living in rather small quarters for one reason or another – empty nesters who have decided to downsize, first time buyers on a tight budget, and city dwellers in studio apartments. These properties can be quite charming, but they generally come with a very little kitchen. Ideas for making the most of a really small kitchen abound. While it is definitely hard to pare down and edit our possessions, one can think about it in a good way – how many sets of dishes do we really need? 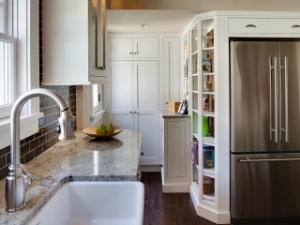 We offer the following tips for making the most of a tight kitchen space. *Make every inch of space livable and your small kitchen can still be big on style and efficiency. * If possible, remove a wall between the kitchen and another living space. Even though some wall space may be sacrificed, this will make the space appear larger and keep it airy and light. * Open shelving can also make the space appear larger and will help to keep you organized and allow for greater ease in finding things. * A good way to let in the light and make the space appear to be so much larger is by installing antique mirrored glass on cabinet doors or by using a mirrored backsplash. * Go high with upper cabinets for extra storage. * Even a small kitchen may have room for an island to provide much needed storage or seating – it can become an “everything” space. * Speaking of storage, consider a built-in banquette. Banquettes are great because they can fit into small corners or under windows. They provide extra seating because more people can squeeze around the table, and they can provide additional storage underneath. * Look for scaled-down or innovative appliances if need be – things like two-burner stoves or refrigerator and freezer drawers. Pull out pantry shelves can fit into a tiny sliver of space. As always in design go for function! While a small kitchen may not be able to accommodate everything a larger one can (things like office or homework space, laundry duties, or lounge space), it can still be workable and beautiful to boot. And, think of all the positives. You may be able to splurge on higher-end finishes because you won’t need as much, and think of all the steps you can save when working in a small kitchen! We are always on the look out for new and interesting items to share with our design clients. From time to time, we post some of the things we have recently discovered. Here are a few of them. We have just discovered a company that makes stylish custom doors, panels, and drawer faces for Ikea cabinets. Based in Los Angeles, Semihandmade makes it possible to have a beautiful kitchen for a much lower price. Unlike other major cabinet manufactures, it is possible to purchase Ikea cabinets without the drawers and doors. They are sturdy and cost-effective – so, even after adding the beautiful customized doors from Semihandmade the final cost will be much less than the cost of a typical custom kitchen. According to owner John McDonald, they offer over 50 different doors in a wide range of prices and finishes. We found so many choices that we loved – just a few include the high gloss colors, textured melamines, and one-of-a-kind reclaimed wood panels. Take a look at www.Semihandmade.com for more ideas and information. We have most often used Kravet for their fabrics and trims, but they are also known for their fine furniture, wallcoverings, and rugs. Recently, they introduced their Modern Luxe line of hide area rugs in an array of natural colors and several different compositions including plank, chevron, and tile. The rich, textural and rustic beauty of these rugs comes in part from the hand-stitching and from the different directions in which the artisans lay the hair. We would love to use one of these rugs in one of our designs sometime soon!